Chibis are super deformed, yet adorable characters that have lately have made a splash in the boardgaming and miniature industries with games such as Super Dungeon Explore, Arcadia Quest, Ninja all stars and many others. They're also featured in collectible figurines and in other geeky paraphernalia. What if you could bring hundreds of characters into your gaming hobby? Characters from pop culture, fiction, and awesome originals? with the power of 3d printing, You can! My name is Heriberto, and alongside my dearest girlfriend: Dia, we've partnered to bring the cute to your 3d printer. Actually... We're not new to the Chibi miniatures game. We've created many hobby miniatures for games and brands. And also, free designs you've seen featured in Thingiverse, My Mini factory, and other quality filesharing websites around the net. 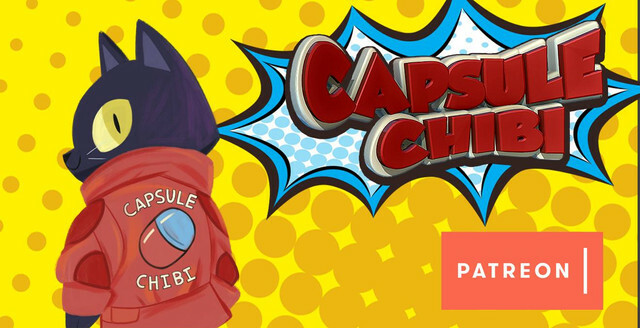 The Capsule chibi project is created by Heriberto Valle and Dia Arízaga. Two budding artists from Mexico. We share a love for art both traditional and pop, and an interest in character design and modern media. The leader of the miniature and hobby sculptors of Märchen Atelier. Creating and sculpting for brands such as Daruma, Stonemeier games, Hysterical Games, Druid city games, and many, many more. Random Characters every month that can be either Originals, fan art, or creatures. Fun! So, join today at any level you wish and Get some cuteness in your 3d life! AT THE CURRENT LEVEL, WHAT CAN I GET? Let's Dungeon! (2$ Usd) Get at least 1 monster model a month! Capsule Casual (3$ Usd) Get 1 free character from the other tiers at random! Capsule Captor (5$ Usd) Get 4 + 1 Vehicle! Capsule Impact (12$ Usd) Get an original and exclusive new miniature created in collaboration with Impact! miniatures. Get all 5 miniatures + 1 vehicle! Several levels of 3d printed STL files and images. STL files are the most common format for this. And, they are already decimated. Feel free to re-scale for customization. Will you send me a printed model? Board games, Role playing games, figures for children and others, collectibles, hobby models, Anywhere! Can I sell the printed 3d models? Please, please don't. Models are delivered under an Attribution Non-Commercial noderivatives 4.0 International Creative Commons license. Can I gift the 3d models to a friend? Now you're talking! PLEASE do it. Can I change the size or edit the file in any way? Of course! Please! have all the fun in the world with them! Specially with the editable ones. Can I re sell an edited file from the 10$ tier? Please do not. They are for personal use and for learning. So, I don't have a 3d printer myself but I want the files. Where can I print them? Comment on it! we will consider it if we like it. Also, if there's something you REALLY want to see brought to the world through 3d printing, There's a pledge level for that! Each month, there is a poll where we select from suggestions. But if you still want us to create a custom miniature for personal use, There's a pledge level for that! I'm new to 3d printing and I want to do simple edits on your models like scale or supports. Any recommendations? Yes, download Autodesk Meshmixer. It's free, and you'll get a lot out of it if you're into 3d printing. Join and follow! Every little bit of help matters! Receive a monthly drop of miscellaneous monsters. Fill that dungeon! Get into the Project! Receive a special random character model through the month and 3d print at will. A simplified resolution chibi model for 3d FDM Printers. Double fun and trouble! Get into the project and receive random character models through the month! Up to the current goal! High quality model for FDM and resin (Laser and DLP) printers for Maximum detail. High quality render of the model in an image file. Access to the CAPSULE POLL. Bid on what's next! Triple threat and trouble! Not only do you get the previous rewards, but you'll also get the original Zbrush 4r8 editable file before decimation for your personal use. Want to edit or repose? you can! Original Zbrush Model file you can tweak to your liking. A special, amazing collaboration! This tier of course, doesn't only net you the previous rewards, but also allows you to receive a miniature model STL designed with the Impact! Miniatures team. designed by the Impact miniatures Team. The works! Get your own, original chibi, printable designs. Special creator pledge, YOU tell me what to sculpt for your personal use. (only once a month). High-quality Printable STL file + Image renders. Design WILL be available for Tiers capsule captor and above to download, but please let me know if you'd prefer a personal Comission through messaging. SIX awesome models will drop per month. Yay! One of them will ALWAYS be a vehicle or terrain piece.